NextGen Player - Canada's Premier Entertainment Blog: Is That a LeetBeatMeat T-shirt I See? 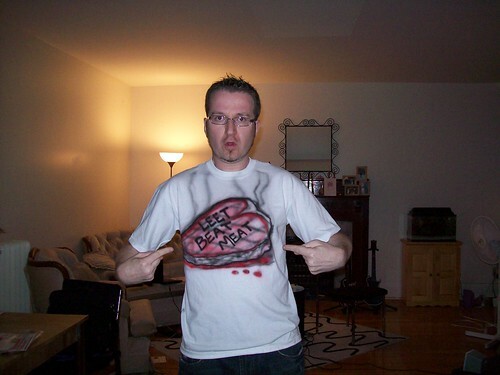 Your eyes are not deceiving you, that is indeed the world's first authentic LeetBeatMeat gamertag t-shirt. It was created by a graffiti artist at the Rogers UGE event that took place this afternoon downtown Toronto. I had a blast and I'll be sharing plenty of experiences, photos and an exclusive interview with the head organizer of the event. Oh, and for those of you not in the know, here's all the background you need to get an understanding of what exactly a LeetBeatMeat is. Mmm steak.